← How to convert Word to pcx using Document Converter? How to convert Word to jpg using Document Converter? There is an original word document,please see Figure1. If you need to convert the document of word to jpg format file,how to do and which software you should take?You may think about many elements about the software then decide one from many kinds of products.The software should support the function of converting word to jpg first,which is the most important.If other formats are supported will be better.Then the software should be low in price,fast in speed and easy in using.So you can choose docPrint Pro which can convert MS Office 97/2000/XP/2003/2007, WordPerfect, AutoCAD DWG, PostScript, Adobe Acrobat PDF and many other document types to Adobe Acrobat PDF, PostScript, EPS, XPS, PCL, JPEG, TIFF, PNG, PCX, EMF, WMF, GIF, TGA, PIC, PCD and BMP etc formats. It works in both GUI version and Command Line version. With docPrint Document Converter Professional you can convert your documents from and to 50+ formats easily.The price of docPrint Pro is $38USD and the process of converting word to jpg will only cost you no more than 2 minutes,which will save your precise time a lot. 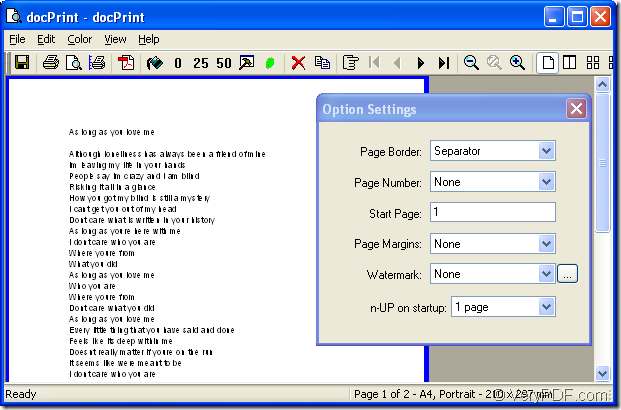 So you can download docPrint Pro at http://www.verypdf.com/artprint/docprint_pro_setup.exe and install it in your computer.Then follow the conversion steps with this article to meet your need about converting word to jpg format file. 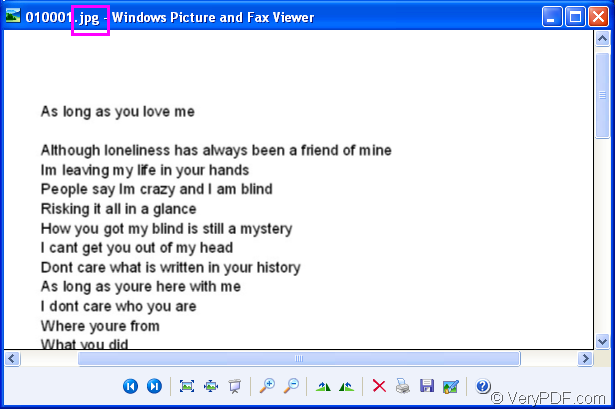 Firstly,you can open the word document by double clicking the icon or right click the icon and click “open” option.If you have opened it,you can ignore this and run printer driver in your computer directly by clicking “File” and “Print” in the dropdown list.The hot key “Ctrl”+ “P” will also help you do the same work to pop up the “Print” dialog box.You should choose “docPrint Pro” as your printer in “Name” combo box,then click “OK” button.Please see Figure2. 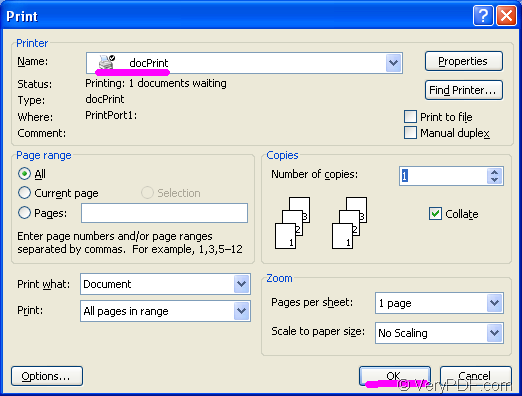 Secondly,the popup “docPrint” dialog will show you a friendly and clear interface in which you can set many parameters for the target file and realize many functions such as Resolutions,Watermarks,Paper Scaling,Save Paper and so on.Please see Figure3. 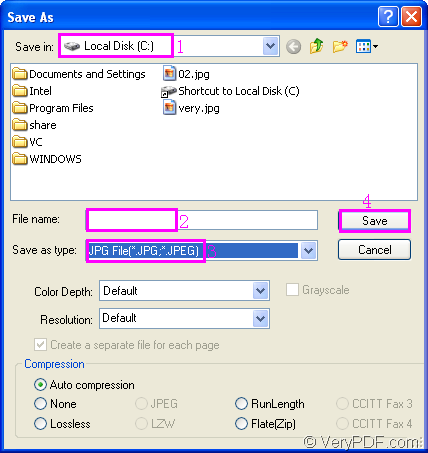 But if you want to convert word to jpg format file without setting any parameters,you can save file directly by the following three ways. 1.Click “File” button in the toolbar and click “Save As” in the dropdown list,then it will pop up “Save As” dialog box showed like the one in Fiugre4. 2.Click button to pop up “Save As” dialog box. 3.Press “Ctrl”+ “S” on your keyboard at the same time. Thirdly,you should set the path,name and file type in “Save As” dialog box. 1.Specify the directory for the target file in “Save in” combo box. 2.Edit the file name in for the target file in “File name” edit box. 3.Specify the file type for the target file in “Save as type” combo box. 4.Click “Save” button to save your target file. After that,you can find your target file in specified directory and you can browse it,please see Figure5. How to convert Word to JPG via command line? How to convert MS Office Excel to jpg using Document Converter? 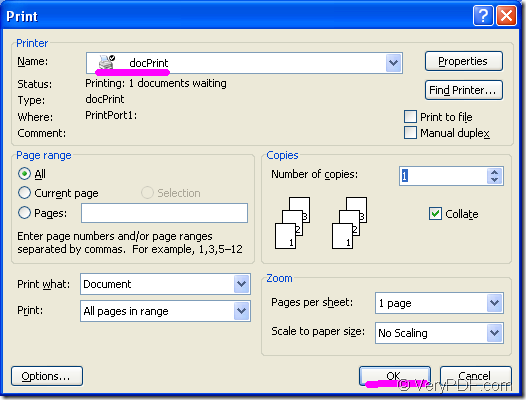 When I click on "docPrint Software" a screen briefly flashes and then disappears. How to convert documents of Microsoft Office PowerPoint to DIB? How to convert DOC to PCL via command line? 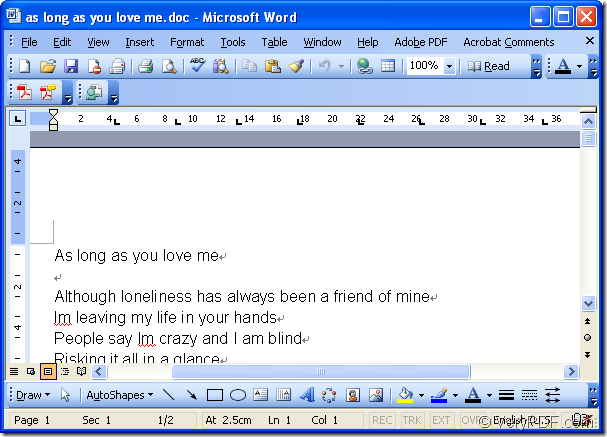 This entry was posted in docPrint Pro and tagged Word to JPG. Bookmark the permalink.